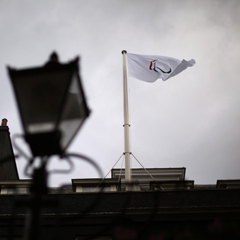 London - The Paralympics flag was raised at 10 Downing Street on Monday as British Prime Minister David Cameron wished the home team luck for the event starting next week in London. "The Paralympic Games began in Britain and our continued commitment to them is clear as we approach the start of the biggest Paralympic Games yet - with more countries, more athletes and more spectators than ever before," Cameron said. "I would like to wish everyone on ParalympicsGB the best of luck for the Games, I will be cheering them on all the way and I know the whole country will be too." Some 4 200 disabled athletes are set to compete in 20 sports during the Paralympics which run from August 29 until September 9, with the 2.5 million available tickets all but sold. The Paralympics come on heels of the London 2012 Olympics which took place between July 27 and August 12 and were labelled "happy and glorious Games" by Olympic supremo Jacques Rogge.